When Disney started re-releasing all their classic animated films in 3D because they like money and their classic films are really worth watching again in the theater, I wrote this review of the 3D release of Beauty and the Beast for Flixist. I bring this up for two reasons. The first is so that you're fully aware that I'm recycling a joke here, and the second is because that's exactly what Professor Layton and the Mysterious Mask is. This is Professor Layton... in 3D. Do you like solving puzzles, charming art work, quirky characters, and ridiculous mysteries? Then you like Professor Layton and you're going to like him in 3D. If you don't enjoy those things, you've probably figured that out by now anyway. Having him in 3D is most likely not going to change your opinion of him unless the prospect of depth really makes you reconsider your love of puzzles. For those keeping up with the adventures of Professor Layton, his apprentice Luke, and his assistant Emmy, this fifth installment in the series takes place before the first three games, but after The Last Specter. Continuing with its predecessor's goal of filling in the back story of Professor Layton and Luke, Miracle Mask actually takes place during two time periods. 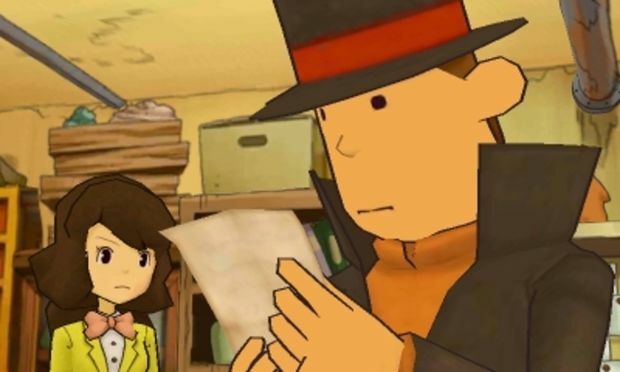 Unlike the faux time travel of Unwound Future, the game actually cuts back and forth between the present day and Professor Layton's past, when the wise, puzzle-solving educator was just a teenager. Like all Layton games, the story involves the Professor being contacted by an old friend to help solve a mystery. This time he is contacted by his childhood best friend's ex-girlfriend to come to the carnival town of Monte d'Or where a strange man wearing the titular Miracle Mask is terrorizing the town. 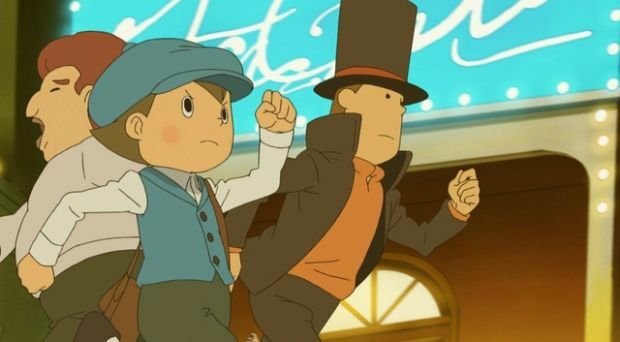 Layton must dig into his past in order to solve the current mystery as he and his best friend Randall were the ones who discovered the mask originally. In this way, each chapter of the story jumps back and forth between the times, filling you in on the back story while while the mystery unfolds. It's actually a great storytelling trick that keeps the plot fresh even if most of Hershel Layton's teenage years are simply expository, puzzle-filled fun. The Layton mysteries aren't really mysteries anyway, but more fantastical excuses to present as many puzzles as possible before revealing a pretty ludicrous ending to the entire affair (*cough* underground recreation of London *cough*). 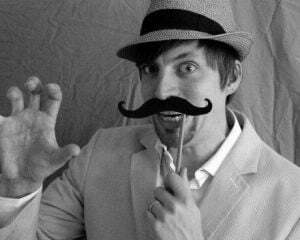 Of course anyone coming to Layton for a grounded mystery is sniffing at the wrong top hat. It's the grandiose charm and quirkiness that makes Layton work so well and it's found in spades once again in Miracle Mask. 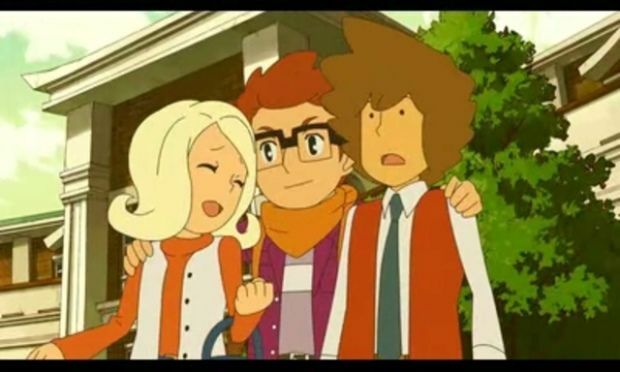 Somehow, Level-5 manages to keep Layton and his cohorts feeling fresh despite this being the fifth game in the series. Professor Layton's gentlemanly demeanor is still as charming as ever and digging into his childhood -- a time when he didn't like puzzles (!) -- is actually quite a treat. The town of Monte d'Or is also dazzling fun to explore, and explodes with more life than any of Layton's previous locales. Part of that life is because Mont d'Or is the flashiest city that Layton has been in, but the majrority of it is thanks to the game's new 3D look. Miracle Mask is a complete redesign of the Professor Layton gameplay for 3D that magically still feels exactly like the previous games. Gone are the admittedly gorgeous 2D frozen images and they're replaced by fully 3D, cell-shaded character models. Every character from Layton to background NPCs are now full-motion, 3D characters. At first, the change may be jarring as you indignantly think that it ruined the art or something like that, but once you're in the game, there is no denying that the new look breathes new life into Layton's world. Characters now move when they talk and the world now feels far more alive than in previous games where the backgrounds were fantastic, but often felt like ghost towns. Another worry was that the push for 3D would ruin the artwork and creativity present in the Layton series, but it's only made them better. 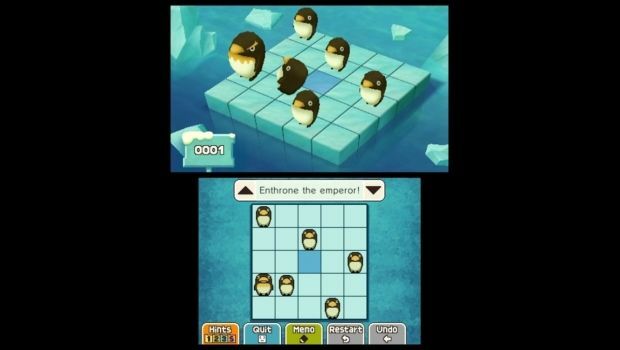 Level-5 really took full advantage of the 3DS's capabilities when it came to the "level" design. Without losing Layton's trademark look, they've built each scene into a spectacular 3D background. Each new section of the Monte d'Or you head into is exciting simply because it looks so good. The same can't be said for the locales in Layton's past, which are a bit more mundane, but that's only in comparison Monte d'Or. Of course, because of the new 3D design, the gameplay had to change a bit. Most of what makes a Professor Layton game a Professor Layton game is still in tact: the main story is told in cutaways to (now 3D) animation; discussions are still handled in text boxes with characters appearing on opposing sides of the screen (though they're now moving as they speak); and you still move from one still area to another, clicking on people and objects to unlock stories or find hint coins. However, since the top screen is now the screen that holds the image you're searching around in, you are no longer directly touching it. Instead your stylus controls a magnifying glass that pops in and out of the different depths of the scene as it runs over items. It's actually pretty cool to simply see the cursor bounce around the screen's depth, and even a jaded film critic like me, who is about to stab every film that comes out in 3D, had a moment of, "Damn, that's pretty neat." You can, of course, easily slide the 3DS out of 3D mode, but I found that really detracted from the game's look. Now that multiple paragraphs have been wasted discussing the visuals in a game about puzzles, we should probably talk about the puzzles. The problem is they're really just great puzzles and that sums it up. The puzzles in Miracle Mask were a bit more difficult (or maybe I'm just getting dumber) than in prior games, but there's nothing especially profound to say about them. All the puzzles are up to the same quality and charm of the previous four titles. There's some pretty clever new ones in there, but it's more of what you've seen before, and that isn't a bad thing at all. I would have liked for the developers to have integrated the 3D into the puzzles a bit more. Some of the puzzles have top-screen action that adds embellishment, but none really utilize the depth for any practical reason. There is an action game where Layton rides a horse that is an obvious attempt to really emphasize the 3D, but it's lackluster at best. There's also another section in the game that breaks with Layton tradition pretty roughly by turning into a top-down dungeon exploration game, like a very simplified Legend of Zelda. It's actually a fun and decently lengthy twist where each room in the dungeon is a puzzle based on moving boulders and avoiding automated enemies. It's a great diversion from the standard Layton action, but never really gets the chance to take off in any meaningful way. The room puzzles never get particularly challenging, which is odd because the traditional-style puzzles found in that section are. As with previous Layton games, there is a plethora of extra content (though not as robust an offering as the last game's RPG, London Life). There's a clever shop puzzle game where you have to align items by color and type so that customers will buy them, a guide-the-robot game in which you must help a robot reach a certain point, and a more in-depth game where you have to teach a rabbit tricks and then have him perform them in a play. The latter of the three gets old quick -- the rabbit is not as much fun to train as one would hope despite the fact that he is adorable. Once again the puzzles don't stop at the end of the game as new puzzles become available weekly. Like all of the other Professor Layton games, it simply comes down to whether or not you enjoy solving puzzles. Fans will enjoy the added life, charm, and depth (yes, I said it) that the 3D redesign brings to the series, but this isn't going to win over any non-Layton lovers. The beauty of it is that no one really wants the series to change. In a gaming world where everyone demands that the next game bring something new and different, it's a little refreshing that a gentleman in a top hat can deliver consistent, quality gaming that pleases despite the fact that it's just what we played before... but now in 3D.